A fresh, modern CV template in coordinating orange and blue, with bright icons highlighting the individual sections. Like all of our templates, you can fully edit each of the elements in Microsoft Word to customise this CV. The heading makes use of the Aparajita font which you can download below. Orange and blue creative CV template with shaded sections and icon-enhanced headings	Overall rating:	3.7	out of 5 based on 9	reviews. Fresh, modern and eye catching, our orange and blue template is designed to grab your would-be employer's attention. With all the usual sections you'll need, it's easy to edit and you'll have the perfect CV ready and waiting to be sent out in no time at all. Imagine having your CV thrown into the bin for almost every role you apply for? If this is happening to you at the moment or you want to prevent it from happening, then read on. First of all, make sure you’re not applying for roles that are above your current skillset, otherwise you will always struggle to get a foot in the door. For more information on this topic, please read our article – Should you apply for a job if you’re underqualified? If you want to ensure you give yourself the best possible chance of an interview and to avoid having your CV thrown in the bin, don’t fall for these 3 common mistakes. The best way to avoid any spelling mistakes or grammatical errors is to have your CV checked by someone else. Preferably someone you can trust, and has some prior experience with reading and writing CVs – hiring and managerial experience. Simply using the spell checker tool on your word processor is not going to be enough, as there are lots of things that could still go wrong. Not only could the spell checker decide to change a correct word, but it may also want to re-phrase certain sentences which might not need changing. The spell checker may also miss certain grammatical errors, which will not go down well with the employer. Sure, you should still use a spell checker once you’ve finished the CV, but then you need to check it yourself at least 5 times, and then pass it on to someone else for another proofread. Top tip – another perk to having an expert check over your CV is that they may also be able to provide advice on other aspects – your presentation, layout, font size and style, relevancy to the role, and much more. Provide them with the job advert so they can see the title and description of the role, and also the company you are applying too. This might be a simple one to get right, but you’d be surprised how many people still get it wrong. Whether they fail to include a cover letter or completely miss out the hobbies or references section, the simple solution is to use a CV template to ensure you don’t miss anything out. 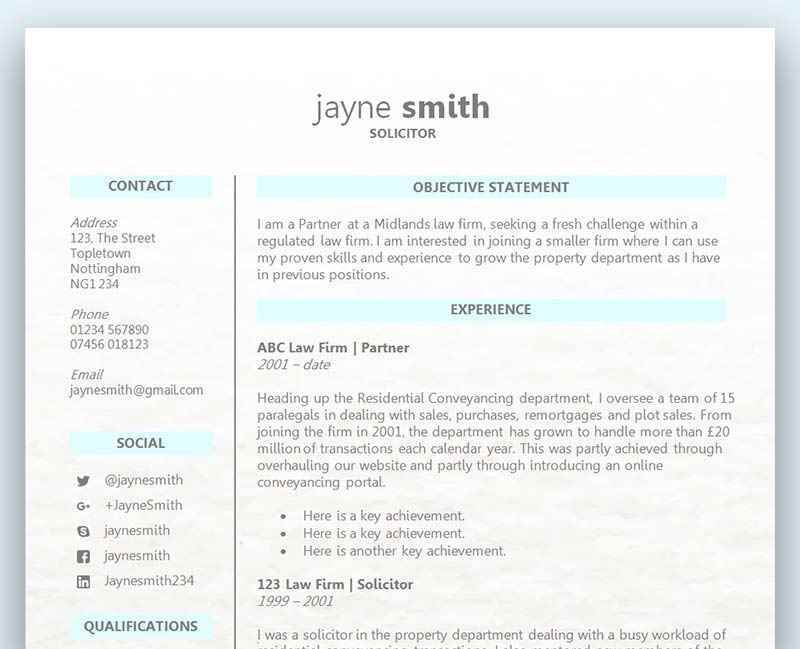 There are lots of advantages to using a CV template rather than create your own. First of all, the amount of time this will save you is huge. Creating a CV completely from scratch with no template to work from is extremely difficult and stressful. That time can be better spent on the actual content of your CV, allowing the template to do all the presentation work for you. CV templates are a great way to also ensure your CV looks professional and stands out from the rest. With literally hundreds of other applications, you can’t afford to make a mistake when it comes to all of the sections that are required. Every job advert will provide you with lots of information to ensure your CV is tailored to the role/industry. A lot of job seekers write generic CVs that go out to many different employers, and won’t make it easy for the recruitment manager to see who is the right candidate. Don’t make this mistake, and make full use of the information that’s easily available to you – like the job advert, job description, company information, website, social media, and so on. So in order to ensure your CV isn’t thrown in the bin, you need to write yours according to the role you’re applying for. Make sure you use certain keywords and phrases that are present in the job advert. If they are looking for someone with a certain set of skills and qualifications, then don’t make it hard for them and bury this information within your CV. Bring all the relevant information to the top of your CV and make sure everything is highlighted and easy to spot. When the hiring manager has hundreds of CVs to read, they want there life to be as easy as possible, especially when they might only spend about 30 seconds per CV. If you’re not getting many callbacks for a job interview, here are 10 reasons why you didn’t make it to the interview stage.